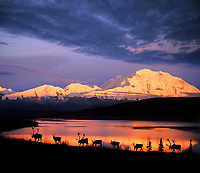 The Barren ground caribou inhabits much of Alaska in large nomadic herds. While both sexes have antlers, the male or bull caribou is the majestic one, whose rack can be large and broad. They are well suited for travel in heavy snow, tundra wetlands, and cover hundreds of miles during their migration routes across Alaska's tundra. next » | 325 sample images from this category. Try a keyword search to see them all. 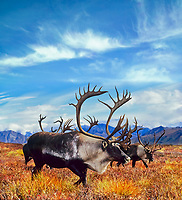 Bull caribou, Arctic North Slope, Alaska.